Mommy's Kitchen - Recipes From my Texas Kitchen: Kid Friendly Taco Burritos & A Winner!!! Kid Friendly Taco Burritos & A Winner!!! 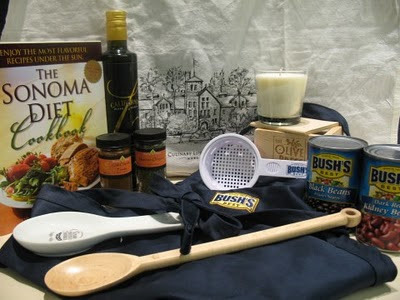 Hi everyone today I am going to be announcing the winner of the Bush's Beans Gift Basket. I will post the winning comment at the end of this post. First I wanted to share with you a pretty quick and easy recipe for Kid Friendly Taco Burritos. I call them kid friendly because they have everything you find in a taco but in burrito form. And who doesn't like taco's. I have to admit they can get kind of boring and a little messy at times. Well at least that's how it is in our house. So every once in a while we change things up and have taco burritos. Everyone can add what ever topping that they want and customize their very own taco burrito. This is what's so great about this recipe. Me, my husband and oldest son love all the fix ens. But my daughter on the other hand just likes beans and cheese. So you see everyone can assemble their own burrito just how they want it. For the kiddos the burritos can be easily cut in half for little hands. No more messy taco's cracking and falling apart. This is the perfect weeknight easy meal. I hope you will give these burritos a try because they are big hit in our house. I have also included a recipe for Semi Homemade Refried Beans. Homemade is best but these are so quick and easy, plus they are so much better than the canned re fried beans. In a large skillet brown ground beef. Drain off any grease and place the meat back into the skillet. Add the taco seasoning and the amount of water stated on the packet. Let the meat mixture simmer until it starts to thicken up. While your meat is cooking you can prepare your toppings for your burritos. Tear or shred the lettuce, chop the tomatoes, slice the onions, slice the avocado or prepare guacamole. Drain the liquid from the black Olivie's. Turn off the meat mixture when it is completely cooked. Prepare the re fried beans (recipe below). When the meat and the beans are done you can assemble your burritos. Take a tortilla and spread a thin layer of beans on half of it. Add the taco meat and sprinkle on the cheese. Then add whatever taco fix ens that you like. Top with sour cream, salsa and and what every else you would like. Roll up burrito and serve. In a large skillet, heat bacon drippings over medium heat. Add the garlic and cook, stirring constantly, for a minute or two. Add both cans of beans but only one of the cans of liquid. Drain and discard the liquid in the second can. Start smashing the beans with a potato masher. I used my Cuisinart Blending Blade attachment. Keep stirring and mashing until you get the texture that you want. Continue to cook stirring frequently, until the beans are the consistency of soft mashed potatoes. Taste and season with salt if needed. When heated through serve. OK Now for The Winner of the Bush's Beans Gift Basket!!!! Comment # 89 is the winner!!! Susan I will be in contact with you so I can get your mailing address. Thank you to everyone who participated in this giveaway. Taco Burritos.. man those look good! Thank you for posting this. Congrats to the winner! The taco/burritos look great to me. Congrats Susan! What a great prize! Those burritos look awesome! I'll have to try them on my boys. Thanks again, Tina! I can't wait to get the gift basket! My Girl is already asking if she can have the canned beans...we LOVE Bush's beans! Congrats to the winner,Nice blog & good post. You have beautifully maintained it, you must try this website which really helps to increase your traffic. hope u have a wonderful day & awaiting for more new post. Keep Blogging!